Thank you thank you guys for all your suggestions regarding artwork, I am a little overwhelmed with the response its beenÂ amazing but I am going through everything you have sent in so thank youÂ again. Please forgive if I don’t personally answer each email there have been hundreds! The life of an interior designer can be a demanding one, one day you could be working on one of the largest spas in the US the next you are furnishing a minuscule apartment. I’m extremely lucky in that I only (these days) take on projects that I want to do and so consequently have scaled back big time on the interior design side. However I do have some tricks up my sleeve that I implement time and time again. Mix styles as many as you can â especially vintage for me its pretty fundamental. Firstly no one will then have the same thing and secondly vintage pieces tell a narrative, have a patina and texture that its hard to emulate with new stuff. Plonk an old lamp on an Ikea console and you would be surprised how it elevates it. Everyone thinks the consoles in my house are from B&B Italia – nope-just Ikea but itâs the things that you put on them that then take it to another level. Don’t go down the time trap. By this I mean thinking you will only be inÂ space the shortest time, before you sell or re rentÂ so itâs not worth doing anything. You won’t truly be able to feel at home unless you paint walls and surround yourself with stuff you love. We’ve decorated apartments before with the owners knowing they are going to move on in a years time – but a year is a year its still a long time. Once when shooting in the Middle East one of the team literally transformed her hotel room (we were there for like 3 weeks) adding candles, changing lampshades, adding throws. I remember thinking thatâs a little crazy, but actually why not make a place that you are in for the shortest time feel more like home. Add sheen – a shiny metallic leather cushion, a glossy side table, a vase it will add another dynamic to the space and help mix up the textures. Interior designers decorate in contrasts (contrasts as I say all the time create friction and the more friction the cooler the space). Don’t match if you can help it. A couple of chairs fine, the same couple of lamps also fine but stop there. The more you match the more boring the space. Its strange I know to show you an image of shelves rather than a whole room but it nails what I’ve been saying. 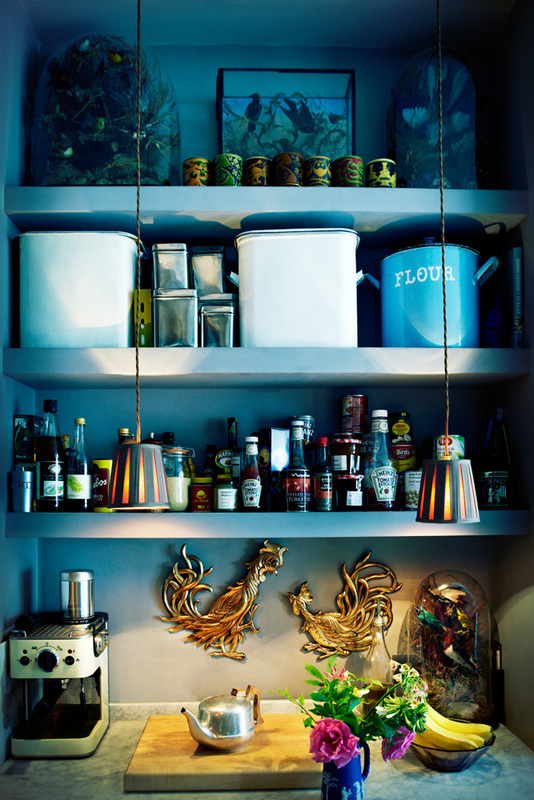 Its the home of the designer Shaun Clarkson, and the mix is fabulous. The odd thing in pairs, the odd bit of vintage the odd bit of shiny. Chuck in a few tomato ketchup up bottles and its going to look bonkers right! Nope it looks amazing, check it out! That is me done, I’ve got a team in shooting the house today so its a quick whiz to the gym and then the 2 M’s and I have to scrub up!